Thanks to one of my nurses, Linda, for telling me about this film. 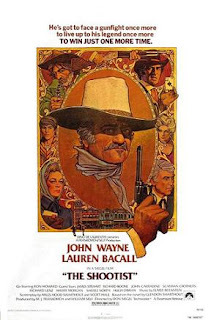 Westerns aren't my usual movie fare but hearing about the plot of this one along with the all-star cast (John Wayne, Jimmy Stewart, Lauren Bacall, Ron Howard, Harry Morgan) convinced me to check it out. Doc:Books, every few days I have to tell a man or a woman something I don't want to. I've been practicing medicine for 29 years and I still don't know how to do it well. Books: Why don't you just say it flat out? Books: Can't you cut it out doc? Doc: I'd have to gut you like a fish. Books: Well, what can you do? Doc:There's just very little I can do. When the pain gets too bad I can give you something. Books: You told me I was strong as an ox. Doc: Well even an ox dies. Books: How much time do I have? Doc: 2 months, 6 weeks, less. There's no way to tell. Books: What can I... What will I be able to do? Doc: Anything you want at first. Then later on you won't want to. In another conversation with the doctor, Books asks about how it is going to go. Doc Hostetler tries to evade the question at first but then tells him "There'll be an increase in the severity of the pain in your lower spine, your hips, your groin. Do you want me to go on? The pain will become unbearable. No drug will moderate it. If you're lucky you'll loose consciousness and until then you'll scream." He goes on to tell Books, "I would not die a death like I just described... Not if I had your courage." This leads Books to try to go out in a blaze of glory. Hastened death by gun fight. Much of the film is Books coming to grips with his terminal illness, fighting off those who want to take advantage of his death, settling his affairs, and imparting words of wisdom to a young man, Gillom (Ron Howard). Below is the film trailer. This movie came out in 1976 and it was John Wayne's last film. It came out 12 years after he was diagnosed with lung cancer and 3 years before he died of gastric cancer. In many ways, the lives of Books and Wayne are very similar. Both very famous, facing illness and the end of their careers. Also, Lauren Bacall (who stars as a sort of platonic leading lady in the film) had lost her husband, Humphrey Bogart, to esophageal cancer many years earlier. I wonder how this effected her performance in the film. Something interesting from a historical palliative care perspective, they use laudanum (opium mixed with alcohol) for pain control. When Books takes a swig out of the bottle, the question is asked, "That's habit forming, isn't it?" Some things are timeless. Thank you for reminding me of this movie in connection with medicine and death, "old" and "new". I love the conversations between the doctor and the patient. The dialogue, at least, ought to be put up for consideration in some medical school course. It's both human and humane. Ppoore, rn also ecommended The Shootist in a comment from the first post on the top 10 palliative care films. Thanks for pointing that out Christian. I had forgotten that The Shootist came up before. Gail Rae, My nurse Linda has actually used this clip when talking to nurses about delivering bad news. I agree, good teaching points there. When I first saw it, I thought it was interesting that it is mostly the same conversation that we still hear today.